But why would I want this version of Monster Hunter when Monster Hunter World has been such a success on other platforms? It’s a fair question honestly. This is traditional Monster Hunter with its slightly awkward menu navigating, the odd map split into various regions and so much depth you could drown from the sheer amount of options available. But this is all part of the charm – a quintessentially Japanese game, full of bonkers monsters to kill and harvest into armour, with talking cats and more weapons than you can shake a Jaggi tail at. As with any traditional Monster Hunter title, those new to the series are given a bit of a rough ride. Sure, there are tutorials and tips for starting out – training quests are offered before you sink your teeth into the tougher challenges – but Monster Hunter Generations Ultimate isn’t a kind game for an inexperienced hunter. Expect to die, use the wrong items at inopportune times and wander aimlessly around the map. That’s not to say you won’t be having fun, though. Finding your feet is part of the experience and finding the weapon that best suits your playstyle is included within that. You might prefer to play at a distance, shooting projectiles at hulking beasts. Or you may prefer to work with board and sword, balancing defence and attack over both hands. Some flashier players will dual-wield, leaving all defence up to their reactions on dodging and monitoring the stamina bar which sits with the health indicator. However, you choose to play, it all starts the same way – arriving in a village that has a problem with monsters. You’re given a hut to live in, which sits within a hub containing a shop, blacksmith and weapon vendor. There’s a small farmstead to one side which houses the Palico cats who can accompany you on quests, adding in defensive moves, or attacking your prey. Some even find random or rare items for you. They’re a nice feature of the game which can be focused on as much as you choose – upgrading them, personalising their look and attitudes. For such a small aspect of a sprawling title, it’s a surprisingly deep mechanic, which is a real testament to how much content there is here. Missions start off small – hunting for flora in certain biomes and eventually work through killing small deer-like herbivores such as Kelbi, to raptor-esque Jagras and then the larger creatures which take time and tactics to hunt. The game urges you to learn about traps, tracking items such as paintballs and you’re encouraged to hunt out materials for new armour sets and weapons which will stand you in good stead with the terrifying later creatures. One of the more addictive parts of the series is hunting for certain monsters which will drop materials so desperately needed. It becomes a game within itself, as you set yourself tasks to craft more outlandish armour. The further you dive into the game, the more monumental everything becomes from the monsters to the time involved. Monster Hunter Generations Ultimate quests range from only a few minutes early on to hour-long struggles even with co-op teammates on board. Playing this game is like investing in a world and the mechanics that drive it. It’s not an easy game to drop in and out of, despite its portability on the Switch. It’s also not an easy game generally. 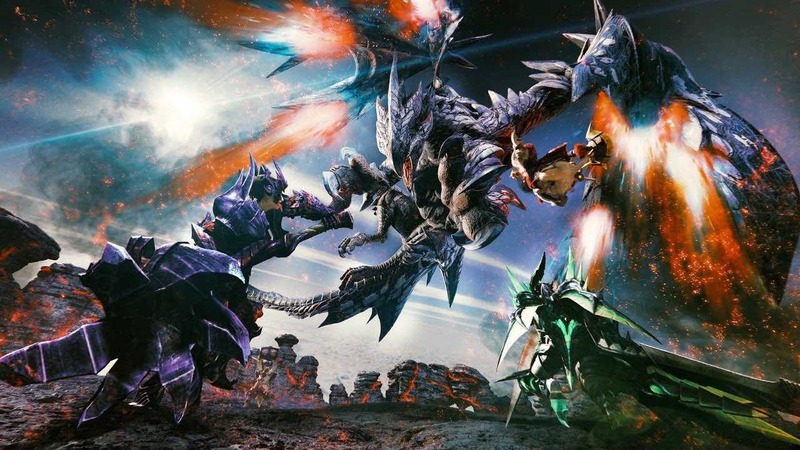 Monster Hunter has never been an ‘easy’ game, but compared to so many other adventure RPGs, Monster Hunter Generations Ultimate can feel like a tough obstacle. The controls feel a little old-fashioned now, they lack a general fluidity and at times you feel as if you’re grinding a lot to acquire specific items. Of course, if you enjoy the grind, or heading out to hunt particular monsters for a time, then you’ll be happy. Ultimately, this is a celebration of the franchise, one that encompasses details from everything that has come before. There are over a hundred monsters, varying play styles and techniques to learn which allow for elaborate flashy special moves. Though playing in handheld is a great way to experience the game, it looks lovely and smooth – after all, Monster Hunter, in Japan is a massive handheld franchise. When docked, the game loses a little of its sharpness, but playing on a Pro Controller is instantly preferable. Monster Hunter Generations Ultimate is like buying a vinyl record of your favourite album. It’s a little dated, a bit niche and to be honest, newer versions are more accessible and easier to interact with. But there’s love there, what it does, is done incredibly well and while the series is moving on over on other platforms, this is the classic formula distilled into a version that can be played at home on a 40” TV or on the bus. You can play it on your own or call in some friends for the tougher G-Rank quests. Being a hunter has never been tougher, but if you’re persistent, it’s never been more rewarding either.